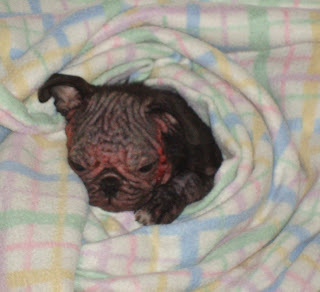 On August 31st we took in a 7 week old black, ( 6 lbs), female Pug, with terrible mange. She was dumped at the 29 Palm shelter and they called us to help her or they would have to put her down. We rushed to get her of course. Right now she has a severe infection from the mange as well as mange. Since her immune system is not developed yet, it has gotten bad quickly. She has very little hair on her. She is running a temperature and we put her on heavy antibiotics before things get worse. She also has coccidia, which we are treating as well. She is itchy and miserable right now. Doesn’t want to eat. We are caring for her around the clock and hoping against hope that it doesn’t get as bad as Carina’s was. We are in desperate need of donation to care for her. If you are able to donate we would appreciate it. Also pass the word to other people that might be able to help us help little Athena. Little Athena is doing okay. here Kennel Cough turned into an upper respiratory infection, but so far with antibiotics we have been able to not have it turn into pneumonia. Due to her age we are limited to the type of antibiotics she can take, but so far so good. Her open sores are looking better and we are still treating her for coccidia. She is going to be a pisspot, as crappy as she feels she has already destroyed two beds and put a hole on a wall :-) She is going to be a handful. Please continue to keep her in your prayers and please help us out with donations as she is going to be anothe expensive one. A little update on Athena. She is doing great, growing and being a craszy puppy now that she feels well. The hair on her body is all about grown in. Her head and face which was the worse part, is taking a little bit longer for the hair to grown. But she already looks like a totally different dog. Pictures coming soon. Poor baby! 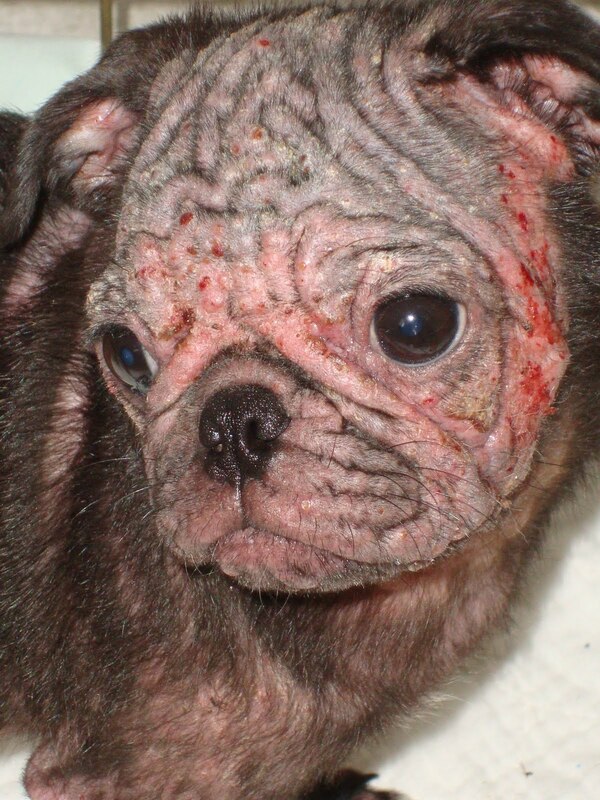 It seems like mange is common in pugs, is that true? It is common in puppies of any breed. Specially if they are not cared for properly while their immnue system develops. Pugs tend to have more health issued than other breeds so maybe that is why we see so many. But I see it in all breeds. Will Athena be available for adoption? Yes when she recovers she will be put up for adoption. Probably in 6 months assuming all goes well. Thank heaven little Athena is being cared for. She is so tiny and sweet. Also, is there any updates on Chance, or Carina? Could you please let me know how little Athena is doing and also I have thought so much about little Carina and Chance. Is Chance able to walk? 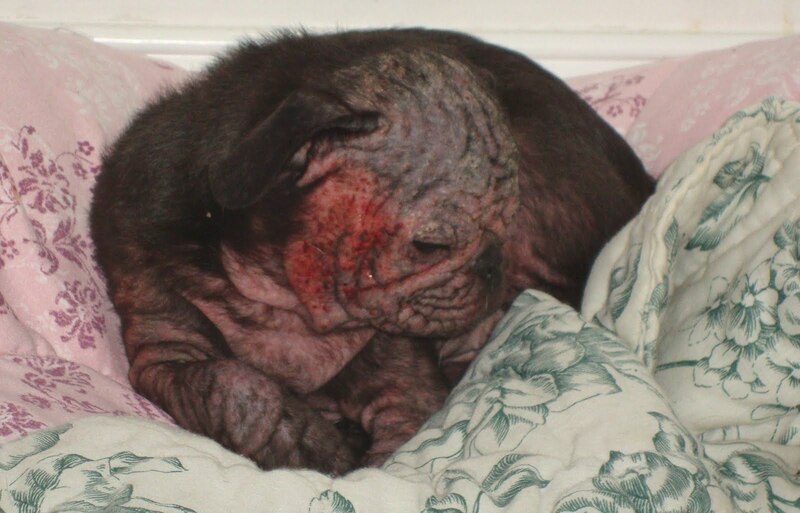 I cried when I saw the photo of little Athena, I still cannot believe what she's been through :( Thank God for the people at Pugs N Pals who have such a huge heart and care so deeply for poor puppy. It was so great to see and meet Athena at the Pugtoberfest this year!!! You guys are my heroes!!! Keep up the great work that you do. My heart goes out to all the pugs that need help. I love them all! Please post updates on Athena and Angelina, the two black pug sisters. Please update status on Athena and Angelina. These postings are a year old. It is not much but , but I know it wont be the last time.